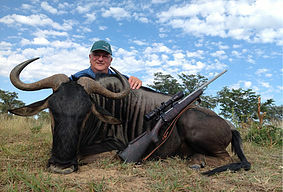 For those of you who love being outdoors rifle in hand in pursuit of game, there is no experience that can equal an African safari. This past spring, I made my fourth trip to South Africa. My goal was to complete the slams on both the spiraled horned antelope (eland, kudu, nyala and bushbuck) and the springboks (common, black, white and copper). I needed only the bushbuck , the white springbok and the copper springbok to complete my slams. I was fortunate to achieve my goal. However, success in Africa begins here at home. 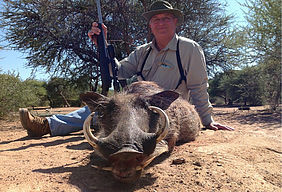 African hunting can be extremely challenging. Having the proper equipment goes a long way into how successful ones hunt will be. First and foremost quality optics are a must. Unlike hunting here in the states, one can hunt all around the clock. 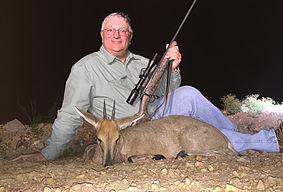 Therefore one needs top quality optics to not only spot game, but to be able to see them in potentially low light conditions in order to make a proper shot. The optics I chose for my binoculars and were Swarovski. For my binoculars, I have the EL 10 x 42’s. On my first elk hunt out west, I quickly recognized my current set of binoculars were woefully inadequate. As soon as I returned to Atlanta, I purchased a set of Swarovski binoculars and have been extremely pleased. Many times hunters focus on only the rifle, but it is the rifle/scope combination that makes the difference. I live by the adage of “one cannot shoot what one cannot see.” One may have the most accurate rifle in the world, but if the scope is not up to the task, the possibility of an errant shot exists. For my rifle and scope combination, I chose Cooper rifles along with Swarovski scopes. I get accuracy and reliability from those products. On this trip, as well as in my previous trips, I have had all one shot kills. On the larger game, I used a Cooper Model 52 in .280 Remington and on the smaller game a Cooper Model 54 in .260 Remington. 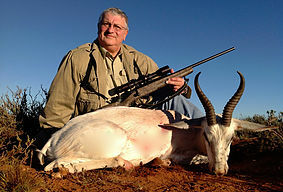 I took my white springbok (286 yards) and my copper springbok (274 yards) in the Northern Cape Province with my .260. From there we travelled north to the Limpopo Province where I bagged my bushbuck (125 yards) with my .280. In all I took 9 animals including a common reedbuck, zebra, blue wildebeest, duiker and two warthogs. The common reedbuck was a particularly nice trophy. 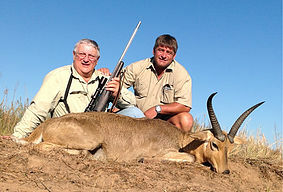 I have hunted with Koos de Meyer of Kuche Safaris since 2008. He runs a first class operation and has access to quality concessions. I highly recommend this outfitter and I am looking forward to making my next trip with Koos.